I’m a LONG time lover of both crochet and Halloween and every year I try to outdo myself from the previous year for my babies! I’m also a die-hard 80s’ kid, it’s forever engrained in my soul! 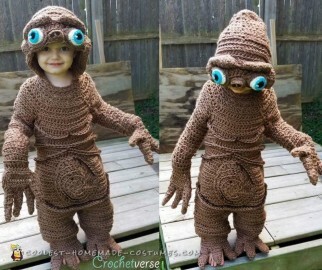 So this year, I went hard for Halloween and freehand crocheted this ET costume for my son! We live in Ohio where sometimes there is even SNOW on Halloween so this ET costume is double duty, it’s warm and adorable! It took me the better part of 4 days working nearly constantly to make him this ET costume, but once an idea is in my head, I kinda go crazy until it’s completed! ET is made with Red Heart super saver yarn, which is very readily available at most stores and I held it double stranded so it would be toasty and work up quickly as well! I began on the rear of the head and simply kept trying it on him as I worked and just stopped when it fit him! I also bought a small red LED light that goes on the finger tip, and I plan to use that on Halloween night! His dad is going to be Elliot, with the red hoodie and all and riding the munchkin around on a bike. I plan to record it on video and share the reactions, haha! Life is about having fun, taking care of others, and spreading joy and happiness. And that is just what I hope my costumes do! Best part other than him? The costume cost me under ten bucks to make! !